Taxis. Food. Cars. Mobile phones. Communications. Banking. Healthcare. Entertainment. In the past ten years, is there an industry startups haven’t upheaved? Startups have been the most transformational force in US society over the past 20 years. Uber has transformed the taxi industry, reducing taxi rides in yellow cabs in San Francisco by 65% in 2 years. Hampton Creek has created an eggless mayonnaise that terrified the US egg industry. Android is arguably the most widely distributed consumer software in history. WhatsApp delivers 50% more messages than all global SMS volumes. As banks stopped lending after 2008, market place lenders like LendingClub and Prosper bloomed and originated $12B of loans in 2014. OneMedical and DoctorsOnDemand have transformed medical experiences for tens of thousands of people. Finally, YouTube and Spotify and Pandora are shifting the media consumption patterns. More than 20% of US homes in 2015 will have cut the cord - and stopped paying for cable TV service. These particular changes to industries sum to a huge macroeconomic impact. Two professors at Stanford’s Graduate School of Business have quantified the impact of startups on the US economy, and in particular on the public markets. 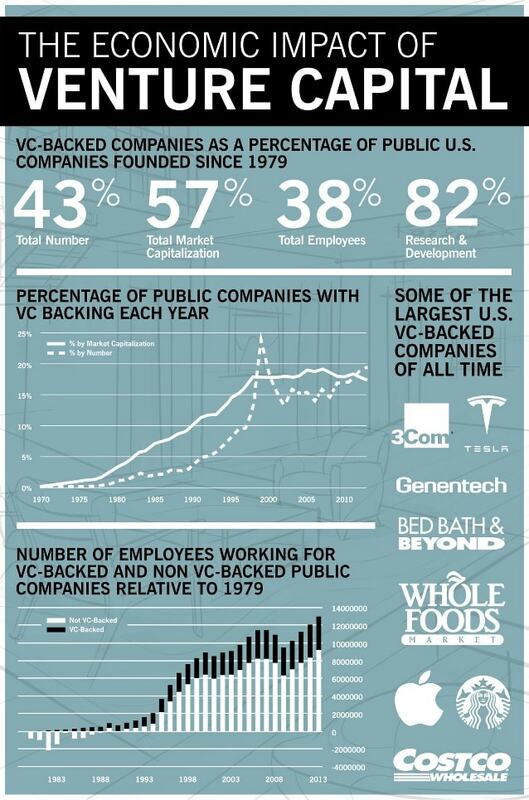 43% of US stocks are venture backed. They represent 57% of US market cap and employ 38% of the public company workforce. A handful of founders with a dream and a little bit of capital can change the world. And these teams are pushing society forward with greater magnitude, greater frequency, and broader impact than ever before. This data is reminder to set aside today’s concerns about short term undulations in the startup market, and reflect on the accomplishments and the broader benefits startups have brought to society. And wonder at what new invention we’ll see that’s waiting for us around the corner.